» How many ions pass through an ion channel per second? Figure 1: Different mechanisms of ion channel gating. The green channel is gated by a transmembrane voltage. The blue channels are gated by ligands that bind the protein and induce a conformational change. The red channel is gated by mechanical forces. Cells regulate their ion concentrations very tightly. Both the identities and quantities of the different ion species within cells play a role in energy storage, protein function, signaling and a variety of other processes. As with many other key cellular parameters, the ionic disposition within cells is controlled carefully both spatially and temporally. Indeed, whole families of proteins exist (see Figure 1) whose job is either to open or close pores in the membrane, thus permitting ions (or other species) in and out of the cell, or to actively pump various species, including ions, against their concentration gradient. Single-molecule studies of the macromolecules of the cell are one of the centerpieces of modern biophysical analysis. These studies had their origins in early work aimed at uncovering the properties of individual ion channels engaged in the transport of ions in the presence of some driving force. There are different classes of driving forces that can gate ion channels. 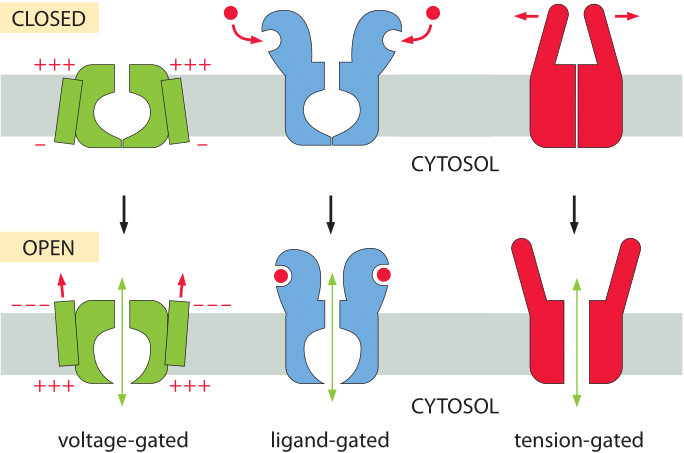 Some channels open in response to the presence of some soluble ligand meaning that the driving force is the concentration of ligands that bind to the channels and change their open probability. In other cases, the driving force is the voltage applied across the membrane that harbors the channels. Finally we mention the opening through mechanical effects by applying membrane tension. These different gating mechanisms are illustrated in Figure 1, which shows schematics of each of the different channel types. 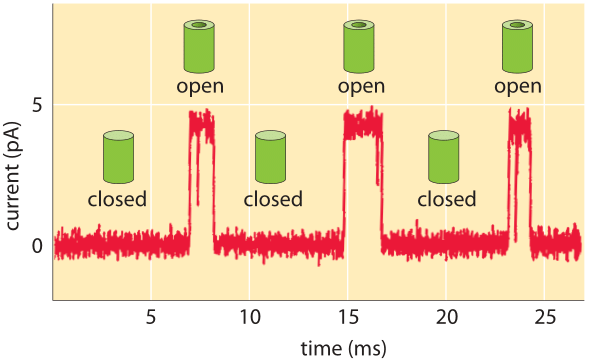 Figure 3: Back of the envelope calculation showing that the characteristic currents observed under physiological conditions translate to about 10 million ions passing through an ion channel per second once the channel is opened. What do the currents measured in single-molecule studies reveal about the dynamics of these channels and the number of ions passing through them? As shown in Figure 2, the outcome of these kinds of experiments is the observation that the characteristic currents through individual channels are measured in pA. We can convert these current levels into a corresponding number of charges traversing the channel each second as shown in Figure 3. If we recall that an Ampere corresponds to a charge flow of 1 Coulomb each second and further, use the fact that the charge on a monovalent ion is approximately 1.6 x 10-19 Coulombs (that is 1 electron or 1 proton charge), then we see that a current of about one pA corresponds to roughly 107 ions passing through the channel each second. This value is in agreement with measurements (BNID 103163) even if not with our daily life intuition that will be hard pressed to imagine 10 million cars passing a bridge that can only hold about 4 cars at any given moment. 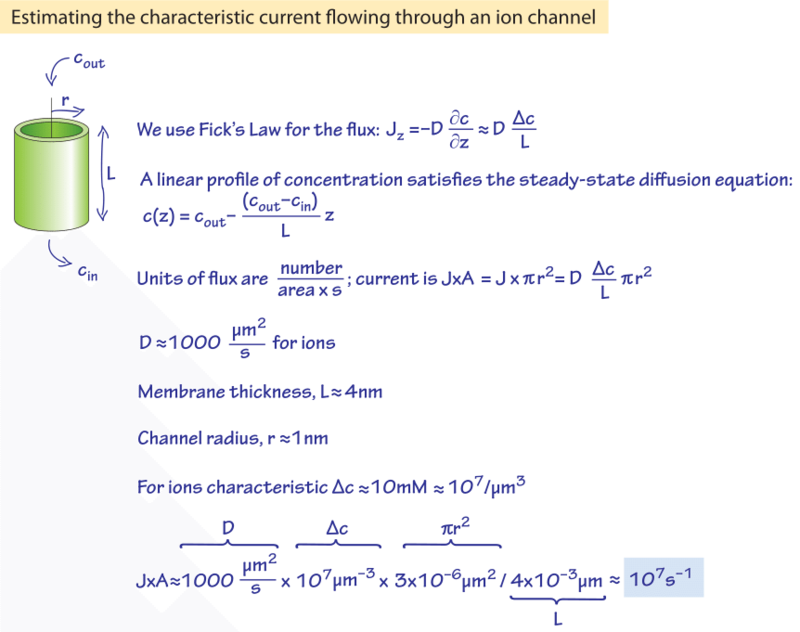 We can rationalize the experimentally observed rates by considering the diffusive consequences of a concentration gradient across the membrane and working out the number of ions we expect to cross the channel each second as shown in Figure 4. Ions flowing in channels akin to the ionic channels above also drive the flagellar motor of bacteria by coupling of the motor to the transport of the protons down their chemiosmotic gradient. The rate of proton transport in these channels is about three orders of magnitude slower at 104 per second (BNID 109822) and is as a result one of the channels with lowest conductance.